Broadcast on Channel 5 (UK) 13 April 1997 Sun 4:40 a.m.
For this and the next episode only, the mugshot sequence includes Franky in place of Bea. Doreen also appears in place of Lynn and Lynn is moved up to take Karen's place. Lizzie gets left behind and when Franky and Doreen go back for her, it seems her heart isn't up to the strain of an escape. Franky and Doreen take her back as far as the fence and Lizzie asks the guard to let her back in. The women are locked in their cells and Vera treats the women roughly as she realises that all the incidents around the time of the escape showed that all the women were in on it. Bea warns Marilyn not to antagonise the officers or she will spend longer inside. Erica questions Lizzie in the infirmary, but can get nothing from her about Franky and Doreen's plans. Franky has to urge Doreen to act normal (which is a bit hard for a big girl in dungarees carrying a teddy bear). Lizzie tells Greg she has no family (apart from a brother) so she wasn't serious about escaping. Erica has to calm Vera down from urging a complete review of security, though Vera gets the chance to smirk when she hears Erica trying to field a call from a reporter about the escape. Greg invites himself to dinner with Meg to use up the unused portion, when she finds that Marty has left a note to say he won't be home. 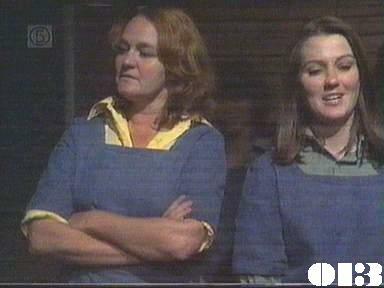 Franky and Doreen have no cash for food and have to mug a boy for a portion of fish and chips. Doreen and Frank hide out in a barn for the night. Vera accuses Mum of knowing about the escape and of failing to raise the alarm when she was in the garden at the time. Doreen tells Franky about her childhood with her violent father: he worked in the stables at a racecourse and was gentle to horses, but cruel to his daughter who he was bringing up alone after his wife left. Lynn hears the news about the escape on the radio: she tries to tell Doug but he is more interested in consummating the marriage. Vera catches Marilyn and Eddie cuddling after chatting about their future and spitefully reports Eddie to Erica. Doug tells Lynn about the pay-roll job. Mum denies all knowledge of the escape when questioned by Erica: Vera is indignant that Erica is unwilling to take the matter any further. Erica frankly tells Vera her attitude isn't satisfactory, but Vera just gets more cheeky and asks if she intends to provide a double bed for Marilyn and Eddie. Lynn phones Meg to let her know about her wedding, but she isn't as enthusiastic about it as Lynn had hoped. Meg hears from Erica that a new social worker will be starting and will be given Bill's old officer. Karen agrees to offer classes to the women, and shortly afterwards Marilyn tells Karen she wants to learn book-keeping to help Eddie. Erica is forced to cancel the electrical contract with the firm Eddie works for. Doug convinces Lynn to be the getaway driver and decoy for the pay-roll job when he threatens to get "some moll off the street" or even to knock the guard unconscious if she won't take part.